What Is Pigeon Fever In Horses? Once the bacteria have entered your horse’s skin, there may be external abscesses, internal abscesses, or ulcerative lymphangitis. The vast majority of horses develop external abscesses, which can form anywhere along the body or limbs, but are most commonly seen on the midline of the belly and in the pectoral (chest) region. Internal abscesses are more difficult to diagnose. They can develop when bacteria are carried into the horse’s body and infect internal organs. Ulcerative lymphangitis accounts for less than 1% of Pigeon Fever cases. This form causes swelling and ulcerations on the horse’s lower legs, and is extremely painful. What is the treatment for Pigeon Fever in Horses? 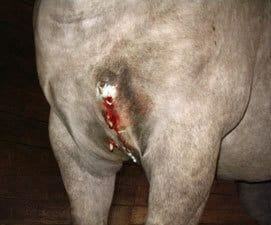 Most veterinarians agree that lancing the abscess and collecting the pus, instead of having the wound drain and further contaminate the soil, is preferred. Flies collecting on pus or infected soil could spread the disease. Once lanced and pus collected, the application of a quality anti-bacterial solution such as Banixx Horse & Pet Care is recommended. Banixx is a unique low pH solution. Most bacteria simply cannot survive in a low pH environment, so apply Banixx, and goodbye infection. Studies have shown that The Big Three Bacteria; Salmonella, Pseudomonas, Staphylococcus, and two major fungi; Aspergillus and Candida disappear when Banixx is applied. Banixx also has a ‘kill’ rate of better than 99% after one minute. Pretty impressive, right? But wait – Banixx’s effectiveness is shown to keep climbing to what veterinarians call a ‘7 log reduction’, which is equal to 99.99999%. Another great reason to keep Banixx on hand is that it can be used for a myriad of ailments, and has a 4-year shelf life that isn’t affected by freezing or extreme heat. The pH doesn’t change, and so it remains tissue-friendly, with no odor or sting to traumatize your horse, dog, or other pets. Why is it called Pigeon Fever? The name probably came from the large external abscesses that form on the chest, giving the horse a pigeon-like silhouette. The first reported cases of Pigeon Fever were in 1915, around the San Francisco Bay area of California, which leads to another misconception, that Pigeon Fever is a California, or a west coast problem. Pigeon Fever has spread to 25 states, Mexico and western Canada. Cases have been diagnosed in Arizona, California, Colorado, Idaho, Kansas, Kentucky, Missouri, Montana, Nevada, New Mexico, Oklahoma, Oregon, Texas, Utah, Washington, and Wyoming. Scientists aren’t sure why the disease is spreading. Climate change may be responsible. Pigeon Fever used to be considered a problem mainly in summer and fall, but is now diagnosed year-round. The C. pseudotuberculosis bacteria can persist in soil for long periods of time, especially in dry weather. Serious droughts in the past few years may have contributed to the migration. How do horses contract the disease? Horses may be infected by flies which are contaminated with the bacteria from the soil, or the discharge from an infected horse. What to do if you suspect your horse may have Pigeon Fever. First, consult with your veterinarian. There are many reasons a horse could develop an abscess. Proper diagnosis is key, and your veterinarian may prescribe antibiotics and/or pain management drugs. Do I have to quarantine a horse with Pigeon Fever? There is rarely more than one horse at a time infected with Pigeon Fever; it isn’t spread like influenza. Keeping the infected horse quarantined is not normally necessary. However, not letting draining pus infect soil or bedding is important, as is diligent attention to fly control. Clean stalls religiously. Apply fly repellant and fly sheets. Good biosecurity is important, and if new horses are brought onto the premises, bear in mind that a horse with Pigeon Fever can take three to four weeks before showing signs. How worried should I be? Pigeon Fever isn’t as deadly as many other diseases, but it is serious. The disease can take weeks to run its course, and calling a veterinarian for a proper diagnosis is best. Also, having pus samples sent in for culturing and antibiotic sensitivity testing will help veterinarians who are researching the disease.